Atlanta Self Storage at 1105 Mt. Vernon Hwy. Located on Mt. Vernon Hwy. just off Hwy. 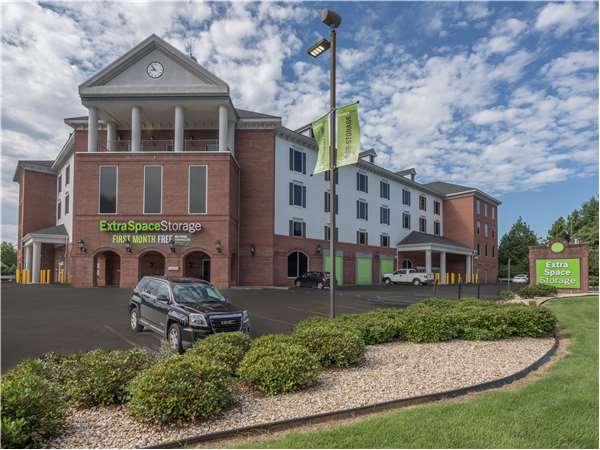 19, Extra Space Storage serves residents of Atlanta near Perimeter Center, Sandy Springs, Dunwoody, and Brookhaven. Locals will recognize our facility next to Home Depot and Costco. We're also accessible for residents of nearby apartments, such as Peachtree Dunwoody Place Luxury Apartments, Parc at Perimeter Apartment Homes, Mount Vernon Flats at The Perimeter, Mount Vernon, Greystar, and 550 Abernathy Apartments. Extra Space Storage is less than half a mile from The Art Institute of Atlanta, making us a convenient solution for college students who need self storage over the summer or while studying abroad. With a large selection of storage units, climate control, wine storage, and excellent security, Extra Space Storage on Mt. Vernon Hwy. is the self storage solution you're looking for in Atlanta. Our Mt. Vernon Hwy. facility has storage units as small as 3x3 and as large as 20x25. Units come with features like climate control, wine storage, reduced height, first-floor access, and elevator access. If you plan to store temperature-sensitive items, climate-controlled storage is a great option. Climate control protects your belongings from extreme heat by maintaining an environment between 55¡F and 85¡F at all times. These units are available in sizes 3x3 to 20x25. Need to store a wine collection? Extra Space Storage in Atlanta offers indoor climate-controlled storage units perfect for protecting your wine bottles. Wine storage units come in sizes 3x3 to 5x12. At Extra Space Storage, we're dedicated to protecting our customers and their belongings. That's why we utilize security measures like video surveillance and security access to your floor only. At Extra Space Storage, we're dedicated to providing each customer with an excellent self storage experience. Our Mt. Vernon Hwy. facility is clean, secure, and well-maintained, and our friendly, professional staff is always available to help with whatever you need. Contact us today to reserve a unit! I live in the metro Atlanta area and there are many options and locations for storage. The Sandy Springs location of Extra Storage was most convenient for me and had the best pricing the size unit I needed. The facility feels safe with many cameras and lighting. The staff is terrific and provides stellar costumer service. Even when I've forgotten my passcode again the staff lends a hand with compassion and humor. Sometimes I go to the facility to pay the bill just to talk with the staff! Great facility. Clean and well maintained. The staff were very attentive, especially Montoya, who went out of her way to make sure my move into the unit was smooth. I had a good overall experience and would use them again. The Mt. Vernon location is very clean, safe and convenient. The staff is awesome! They have been extremely helpful through my long moving process and helped me upgrade to a larger unit when needed. Great customer service. I spoke and worked with 3 different women, all were extremely helpful. Hannah, Lisa and Montoya.also, this storage facility is extremely clean, well lit and have the carts you need to move your stuff in. Good carts. Seems to have a really good security system to....which is important and I am extremely happy with access hours. Extra Space Storage and the staff are polite, professional, and are very focused on you and your storage needs. I know my items are safe. They will call with any issues. A-MAZ-ING people! Extra Space Storage is the one to use. Always secure, clean and in good locations with very helpful staff. They will always take excellent care of your storage needs. Lisa at 1105 Mt Vernon was very helpful and pleasant. Great location, reasonable pricing and responsive staff and management. The people at Extra Space Storage are so friendly and helpful it was a pleasure to work with them. They asked clear simple questions and were able to set me up with the perfect storage for my situation. They were wonderful to work with. This facility is top notch. Excellent customer service! Very friendly and helpful staff. Clean, well-lit and safe facilities. Extra amenities. Several storage options. A great place to store your things! The service was exceptional. Mr. Stacey Dunson was extremely helpful in explaining and providing the space just right for my need. He took his time and explained the written agreement before my signing. He had a very caring manner that made me believe I had come to the right place. I hope he will continue to provide such personable service for his customers. The Dunwoody Extra Space Storage is a great location to consider if you're seeking a facility. They are respectful and eager to assist to make sure your needs are met. I appreciate all of their assistance with my moving extravaganza. It was an excellent experience with employees on the phone and at the facility. They answered all my questions and concerns and were patient in helping me figure out the right size unit. The facility is immaculate, feels very secure and in a terrific and convenient location. Can't ask for anything more! facility was clean and very up to date. Manager was especially helpful and friendly. Great staff, clean and safe facility. CLEAN, INDOOR STORAGE FACILITY; GREAT CUSTOMER SERVICE. This is an impressive operation. Gerard Vega (the store manager) is knowledgeable and takes the time to answer questions and make suggestions. The facility is immaculate. My experience makes me consider investing in this company. The staff at the Mount Vernon Highway location were awesome, very professional and knowledgeable, they made my move-in experience easy and seamless. The quality of the facility is clean, well lit and top-notch. I appreciate the measure of safety that was exercised with the use of cameras and security codes to access elevators. I was very impressed with the gentleman that help me that was in the office and the cleanness of the location and the price was competitive. Great location. Clean. Great customer service. Expanded hours. Great prices for all that you receive! As an occupant of the salon suites and a business owner, it is important to me that every person my clients come in contact with are pleasant. The staff here is absolutely AMAZING (and I'm not just saying it, I truly mean it). Very helpful, great customer service and my clients love how friendly the staff is. That is only the beginning the space is beautiful, clean and really modern. Only great things to say about this facility!!!!! Drive south on US-19. Take exit 5 and turn right onto Abernathy Rd. Turn left onto Barfield Rd NE. Turn left onto Mt Vernon Hwy. Cross Turner McDonald Pkwy and our facility will be on the right. Drive north on GA-400. Continue on US-19. Take exit 5A and merge onto Abernathy Rd NE. Turn right onto Peachtree Dunwoody Rd. Turn right onto Mt Vernon Hwy. Make a U-turn at Crestline Pkwy and our facility will be on the right. Drive southwest on Mt Vernon Rd. Pass Perimeter Center W and continue straight. Make a U-turn at Crestline Pkwy and our facility will be on the right. Drive east on Mt Vernon Hwy. Pass Sandy Springs Public Library and continue straight. Cross Turner McDonald Pkwy and our facility will be on the right.